Glastron Boats: Click here to view the full lineup. Welcome to Sandy Creek Marina! We offer a variety of marine products and our selection is second to none. Sandy Creek Marina prides itself on having the friendliest and most knowledgeable staff. It is our goal to help our customers find the perfect watercraft to fit their lifestyle, along with just the right parts and accessories. Check out our brochures to see what products we offer. If you need help in making your selection, feel free call or stop in—we're always ready to serve you. Sandy Creek Marina is family-owned and operated with two stores. The Breckenridge TX store is conveniently located on the west side of Hubbard Creek Reservoir on US Hwy 180 West, Breckenridge, TX and the Possum Kingdom Store is located on the east side of Possum Kingdom at 1770 FM 2951 near Graford TX. Sandy Creek Marina can provide you with the latest and best in marine products to make your outdoor living more enjoyable. We specialize in offering the latest innovations in boating technology. We combine a wide variety of products with a friendly and knowledgeable staff to meet all of your boating needs. 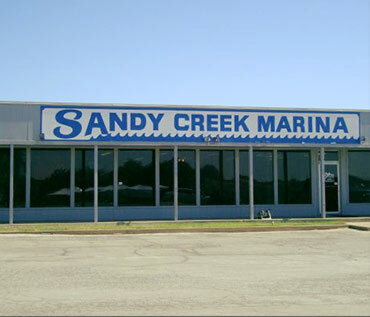 Our goal is to make Sandy Creek Marina your one-stop dealership for sales, service, and fun!